Subject: Why are completed Quest cards hidden? "Turn the fulfilled Quest card face-down and place it on top of your Adventurer Placard." "You may ask for a card count from other players at any time (for example, to count their completed Quests). You may not ask what their total point score is, however - all face-down cards are secret." What's the reason for keeping completed quests hidden/secret? The score at any given moment is perfectly trackable, since it's open information whenever a quest is completed. Isn't it in all the players' interests to try to remember what score their opponents have? And if that's the case, why introduce a memory element to the game, rather than just make it open information? I suppose there is somewhat of a surprise element that can add tension towards the game end, but isn't that only going to be the case if you aren't keeping track of this? I personally keep completed quests face up and off to the side, however it makes sense that you do not give your current score because that would give information that is in your hand. I must admit, even though revealing hidden but traceable information is an easy house rule to adopt, I still get a little twinge in my back when designers actively hide traceable information in their game. Nonetheless, Fantastiqa is a great game. Should have been nominated for Spiel de Jahres for sure. Perhaps it was just a whimsy overload for too many families! I also find this an unnecessary rule. I have been having loads of fun with this game, but have surprisingly found it hard to teach, as newbies typically seem overloaded by the options available on any given turn. We have opted to have the scores as open information, at least for now. 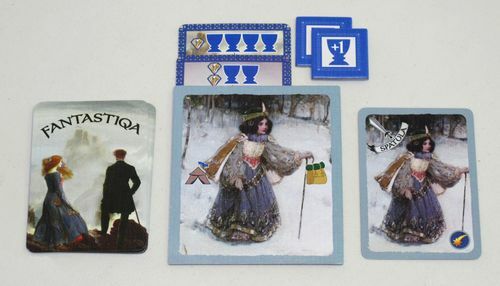 Perhaps in more cutthroat matches with my wife I may eventually play it as hidden information, but for now I see no need to, as I ease players into the game. I do like having some element of surprise--but you're all quite right--the information on these completed Quests is in principle trackable. (I find that I'm no good at remembering other players' scores, myself, though.) I think that available table space was one of my motivations here -- it's important to distinguish complete vs. uncompleted Quests and flipping completed Quests face-down, on top of your Player placard is the simplest and (I think) most elegant way to do it. As always, yes, apply house rules if you feel otherwise! I think that available table space was one of my motivations here -- it's important to distinguish complete vs. uncompleted Quests and flipping completed Quests face-down, on top of your Player placard is the simplest and (I think) most elegant way to do it. As always, yes, apply house rules if you feel otherwise! Thanks for the insight into your design considerations, Alf. We have solved the table space dilemma by stacking all completed quest cards face-UP on the player placard, with just the point totals showing along the top of each card. We have found that the scores required to win are generally low enough that no one accumulates enough completed quest cards that the stack gets too unwieldy. That had been my thought as well: it might be a tad confusing as to what quests one had accomplised and what ones might still be under "construction". In other words, it's a matter of convenience. Thanks for the feedback, all! In future we'll probably just play with them as open information.